Cal Team member Devin Wicks — a Berkeley alum, now director of fitness operations at the campus’s Recreational Sports Facility — reports here on Day 6 of the AIDS LifeCycle, the Lompoc-to-Ventura leg. Day 2: OMG: Santa Cruz to King City, 107 miles!!! VENTURA — This is my sixth year on the road with the AIDS/Lifecycle; my motivation for being a part of it has evolved over time. When I first got involved, it was more for the personal challenge — riding my bike from San Francisco to Los Angeles. Over time, I also got to express my passion and dedication to the cause of HIV/AIDS awareness. Ultimately, I came to truly appreciate the sense of community this ride brings — the kind of community you wish were part of in your everyday life. Here’s what I mean. Last year, for example, I decided to be an ALC roadie for the first time — one of the crew of volunteers who help make the event happen. Having ridden several times, I thought it would be really great to give in a completely different way. Little did I know, at the time was, how much of a commitment it was. It was one year ago to the day that — for the first time in ALC’s history — a leg of the journey was cancelled. I awoke at 4:30 a.m. that day (Day 6) to the pitter-patter of raindrops on the tent — a light rain that became a serious downpour by the time the first riders set out toward the Gaviota Pass. Within an hour, it was decided that the severity of rain — coupled with the morning traffic over the pass — presented too much danger to let the riders continue. So the route was cancelled. From there, we roadies all kicked into high-gear. I was working bike parking — which means being responsible for ensuring that all the riders leave on time in the morning and got checked back into camp in the evening. But our job completely changed with the cancellation of the route. We went from flow managers to logistic aces, trying to figure out how to ship 2,400 bikes 85 miles down the road in less than eight hours. What transpired was truly amazing. In the short time we had to pull off this logistical feat, a community people from all walks of life joined together in total mutual support. No complaints. Only the understanding that we were all in this together and that we had to work together. We had to think about and care for each other to get through this challenge. This year, Day 6 was a completely different experience. We awoke to beautifully clear skies, and soon I was back on my bike, pedaling my way towards LA. We began in Lompoc. Making our way down the coast through Santa Barbara, we ended in Ventura. It couldn’t have been a more perfect day to ride. The weather was stunning and the views of the ocean — with dolphins jumping in the wake, along with the creamy white beaches — made you want to slow down and enjoy every mile of the trip. Unlike last year — where I worked intensely as part of a team — I spent most of the day6 riding on my own. I wanted to have time alone, to take in the day and spend time thinking about the ride, its importance and how that fits into my life. You see, Day 6 is really the last day that all of the riders are still together, without the influence of the outside world. So it’s a very special day for the riders and something I really wanted to savor. 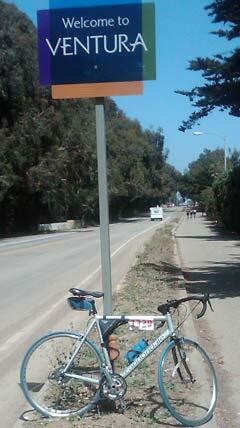 I made my way down the coast and ended in Ventura feeling great. I set up my tent and went through the usual routine of preparing myself for the next day’s ride. In the early afternoon, I got news that one of our riders was in an accident and ended up in the hospital with a broken collar bone. Like last year, we kicked into high gear to see what we could do. When our rider made it back to camp, our Cal team began to come together while he checked into the medical tent for the evening. We got him set up with his things, got him dinner, and spent the evening checking on him to make sure he had everything he needed. Late in the evening, we made our way to the beach, as a team, for one of the most poignant moments of the whole trip, the candlelight vigil. This tradition started several years ago, as a way to remember those who we’ve lost to or who are still struggling with HIV or AIDS. It’s a moment of silent reflection, where nearly 3,000 people — riders, roadies, friends and family — come together to stand in silence. For me, it was a time to reflect on individuals who are no longer in my life and those who still are — both in the outside world and on this journey. It was an opportunity to realize that — while it’s important to travel your journey and take things in in your own way — we are all still part of a larger community. And that when things get challenging — whether it’s trying to figure out how to quickly ship 2,400 bikes, or caring for a friend —we are more successful when we work together, with an ethic of care for one another and goal of making sure everyone makes it down the road.